Miska 2009… The carved stones of the ruined houses and the tombstones of the cemetery have grown together into a single rock covering on the top of the hill. In cracks within this rock a small forest was planted, hiding the remnants of a crime. The destroyed village of Miska is located north of Tel Aviv-Jaffa, 5 kilometres from the Palestinian city of Tira and 15 kilometres from Qalqilya, today part of the West Bank. The villagers were forcibly removed in April 1948, and the village was subsequently destroyed. Only one family was able to stay close to the village. At present there are close to 400 descendants of this family living as internally displaced refugees in the Israeli Palestinian town of Tira, with the rest of the exiled Miska population spread throughout the refugee camps and cities of the West Bank and Jordan. The municipal land of Miska is today managed by the Israeli Land Administration (ILA) which rents it for use as fruit groves to the settlements of Sde Warburg, Mishmeret and kibbutz Ramat Ha-Kovesh. The only significant visible remains of the village are the ruins of a mosque. Until 2007 there was also a school; however, the Israeli authorities demolished the building after it was appropriated for social activities by the refugees of Miska living in Tira. We would like to treat Miska as a material archive for the spatial possibilities of return, investigating through this also the socio-political dimensions of return. 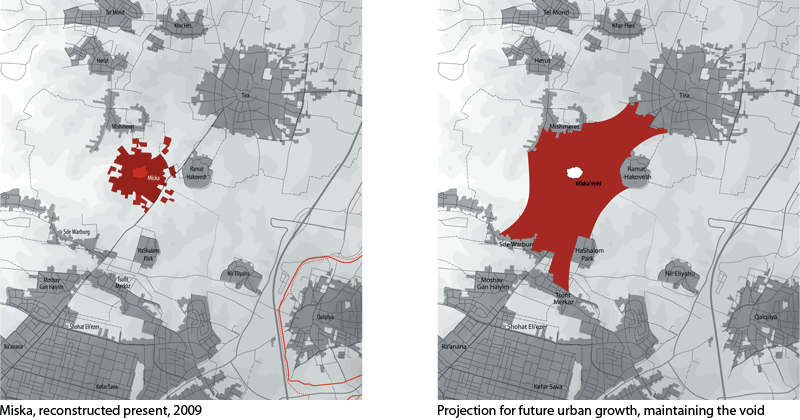 Imagining forms of return of Palestinian refugees also means exploring ways in which the nature of the refugee and its associated spatial dislocation could reshape the political space of the city. Refugee-ness, the most contemporary of predicaments, is a rapid and indeterminate process of transformation that seems to fuel the locomotive of history. The condition of the refugee, an exiled and transnational life, can not be thinkable only with the actual political categories but forced to image a new political space to come.